Gia is a Middle School English Teacher. 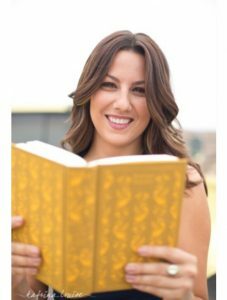 The Common Core State Standards have placed greater emphasis on teaching literacy skills as a means of preparing our students to be successful in the twenty-first century. According to CCSS documents, students must learn to read, write, speak, listen, and use language effectively in a many subjects, not just English. Within this standard, improving the quality of student-to-student discourse is a major part. Although the literacy standards are shared by all disciplines, I couldn’t help but feel a responsibility to find ways of incorporating these skills and strategies into my 50 minute English lessons. As a middle school English teacher, this predicament was defiantly at the forefront of my mind. But how would I do this? How was I supposed to incorporate this essential skill throughout an already standards-packed year? How could I provide opportunities for all of my students to engage in academically rich dialogue? I was not offered professional development; not a single book was given to me, and being that I was a trained NCLB teacher, I didn’t feel prepared to step away from the high stakes testing, teacher-led mentality. Then, I received an email from my principal. Stanford was offering a class online titled: Constructive Classroom Conversations: Mastering Language for the Common Core State Standards. The class seemed to be offering what I was looking for- a place for educators to share, discuss and collaborate about this topic. No one was TELLING me how to teach discourse in the classroom; we were all figuring out how to tackle this standard together. I signed up, became the team lead, which was often times a lot more work, and I began the assignments. I found the articles to be research-based, current, and applicable to my classroom needs. The videos were a great way to view just how teachers were using this new standard in all grade levels and subjects. Between the reading and watching, I was also talking online with educators across the world about this topic. On top of this, I was trying to implement literacy skills into my content through these collaborative conversations, and then share with my teammates what was and was not working. We offered each other new ideas and effective feedback, something that the class leaders stressed the importance of throughout the class. The reading forced you to go in-depth and really analyze what it meant to implement this standard. Although this process was time consuming, in the end, I knew that if I could merely grasp something new about literacy in the classroom, my students would therefore directly benefit greatly from this class too. 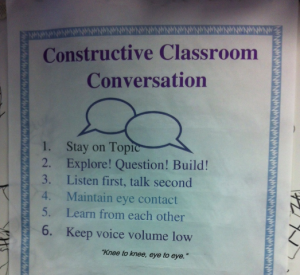 One of the visuals Gia now uses in her course to promote constructive student dialogue. Although there are many layers to literacy in the classroom, one important idea I took away from this class was that I learned how to listen closely to my students, and that listening to their dialogue was an extremely powerful tool. In their discourse about any given topic, they were telling me exactly what they knew, what they were struggling to understand, and what they did not know. A test score didn’t have to tell me this. I altered my mentality about my role as an educator. NCLB told me I am the sole provider of information; students learn through rigorous instruction taught and led by me. In comparison, in the CCSS, for literacy to flourish in the classroom, I, the teacher become the facilitator; I became a guide and a supporter for my students. My focus was less on “I will tell you what you need to know and you will write it down”, to instead allowing time for my students to interact and build their own content and academic language, knowledge, and skills.